Pascale (and baby Florent!) participated in the 2018 Yellowknife Geoscience Forum, which had a very good turn out of permafrost scientists! 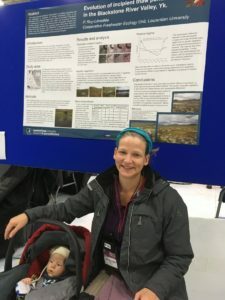 Pascale presented a poster with some data and thought son the Evolution of incipient lowland thermokarst features in the Blackstone River valley, Yukon (abstract on p. 108 of the Forum’s book of abstracts). 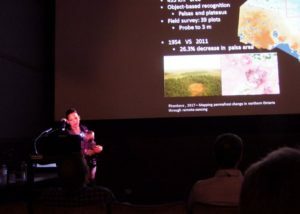 Pascale also presented a brief overview of the thermal monitoring and geomorphological mapping work carried by Maare Packalen, Jim McLaughlin, and Zlatka Pironkova in Ontario Far North. See Permafrost monitoring in the Hudson Bay Lowlands: preliminary results from the Ontario Far North in the Forum’s book of abstracts, p. 60. The stirring committee of the new Canadian Permafrost Association used the opportunity to have a fruitful meeting in person. The new association should be up and running this summer! Kumari Karunaratne and Toni Lewkowicz gave a presentation to update the community and gather input regarding the mission statement, logo, etc. See The formation of a Canadian permafrost association in the abstract book of the Forum, p. 44. Examples of drained thermokarst lake basins with wet, depressed margins and drier ground near the basin centre (all pictures from Google earth): a) Fish Creek Area, Alaska; b) Tuktoyaktuk Peninsula, Northwest Territories; c) N Seward Peninsula, Alaska; d) Dewey Soper Bird Sanctuary, Baffin Island, Nunavut; e) Ayon Island, Chukotka, Siberia; f) Penzhina River area, Kamchatka Krai. 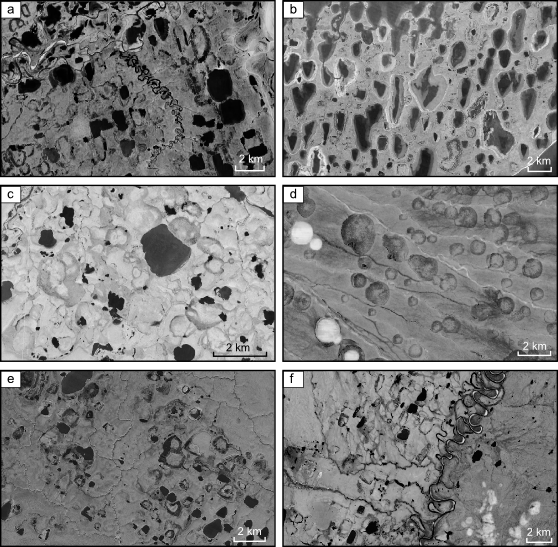 Figure 2.6 from Roy-Leveillee, P. (2014) Permafrost and thermokarst lake dynamics in the Old Crow Flats, northern Yukon, Canada. Ph.D. Thesis, Carleton University: Ottawa, Canada. A paper published by Roy-Leveillee and Burn (2016) in Earth Surface Processes and Landforms presents a new geomorphological model for the drained basin of thermokarst lakes in tundra areas. 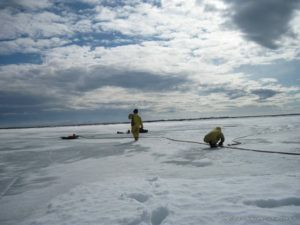 Drained lake basins are widespread in Arctic lowlands affected by thermokarst and, in tundra areas, the topography of these basins typically constitutes a wet, depressed margin surrounding a slightly elevated, better drained centre. This low grade geomorphological feature is widespread in Arctic lowlands (see satellite images to the right), yet the genesis of this topography is poorly understood. Based on conditions observed in Old Crow Flats, this new model suggests that patterns of sediment deposition along the lake bottom during lake expansion is what causes the raised centre and depressed margins revealed once permafrost is re-established in the drained basin floor (see diagram below). This new model differs from that presented by Jorgenson and Shur based on observations of conditions in drained basins of the Alaska Coastal Plain. 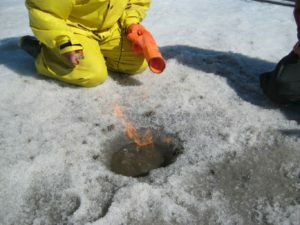 Their model relied on the poor frost-heave potential of gravelly sand which may accumulate near shore and the influence of shallow littoral terraces on permafrost configuration beneath lakes. This model raises the problem of equifinality, as similar topography develops in areas such as Old Crow Flats, where lakes lack littoral shelves and develop in fine-grained glaciolacustrine silts (no sand or gravel). This new conceptual model relies on a mechanism that is applicable in any location where lake shore bank erosion leads to the redistribution of sediment by wave action along the lake bottom. Differences in ground ice content may accentuate the elevation differences between basins and margins in some areas, as reported from the Beaufort Coastal Plain, but it did not in Old Crow Flats. Conceptual model of sedimentation patterns during thermokarst lake expansion (left) and resulting topography after lake drainage and permafrost aggradation (right). Sediment deposits that are in permafrost are marked with a light grey pattern. From Roy-Leveillee and Burn 2016, Fig 15.